Use of asbestos in construction materials was not banned by the EPA until 1978. That means if your home was built before that date, there is a chance that your dwelling contains asbestos in areas that you might not even consider. 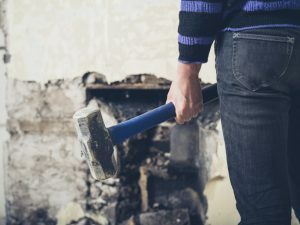 Before you begin any DIY remodeling projects, if you want to keep yourself and your family safe, continue reading to see where asbestos could be lurking in your home! You may not know this, but it is extremely dangerous to have asbestos in your ceiling, because if the barrier surface is damaged in any way, the asbestos particles will become airborne. These particles can float in your air supply for days before settling, which puts anyone who breathes while in your home, in potential danger. Previously, asbestos was frequently used in ductwork due to its insulating and fire-retardant properties. We now know that having asbestos near air pathways is extremely dangerous, so if you are doing any type of work regarding your air ducts, consider hiring a professional to see if there is asbestos in your insulation. If you don’t, you could be allowing asbestos to drift through the whole air circulation system and contaminate your entire household. Your roof can potentially contain asbestos in the roofing felt, cement shingles, roofing underlayment, asphalt roofing shingles, mastics, sealants, and even the flashing. Disrupting asbestos on the roof cannot only lead to soil pollution around your home, but it can also work its way inside your home and wreak more havoc. For those of you thinking about replacing old tiles in your home, you need to consider the impact of disturbing tile riddled with asbestos. Every step you take on them can cause more asbestos to enter into the air. Thankfully, AQHI, Inc is an asbestos certified contractor and knows the processes that need to be followed to ensure that asbestos dust remains contained while removing the floor tiles. Just think of it as us doing the excavation work for you! Before you take down any walls, consider this –a fair amount of drywall installed during the 1960s to the 1980s contains asbestos. It can be found not only in the drywall, but also in the mud that seals the screw holes and joints. Opening this drywall up can lead to vast amounts of asbestos entering into your air supply, which creates a large health hazard. Before you begin any DIY construction project it is essential to consider whether asbestos could be lurking underneath the surface, just as a professional contractor would. At AQHI, Inc we can not only test for asbestos, but also remove any detected asbestos in a safe, professional manner. As the top asbestos removal company in the Los Angeles area, you can rely on us to complete the job in a timely manner, leaving your home clean and safe. Call our office Monday through Friday at 800-481-8080 for more information, or to schedule an appointment.